Abby, an alumni of Art & Design High School started her writing career around 1982, motion tagging on bus lines and the walls of her native Queens, new works neighborhood. It was at Art & Design High School where she discovered early female writer “Heart” aka Lady Heart, thus giving her the confidence that graffiti was not a “boys only” craft. Taking the subway everyday, Abby became further inspired and influenced early on by and aware of a bevy of the females rocking the number and letter lines such as Chick, SS and Lady Pink. Artists she saw up in her home turf of Jamaica, Queens include Cey City and Cer TP, who first took her to bomb the E and F lines. Eventually mentors like Mare139, Seen TC5, Web and Doc nurtured and critiqued her work, as she independently developed her piecing style during her high school years. Abby was up most often on the A, CC, E,F and sometimes N, GG, 2 and 5 lines. 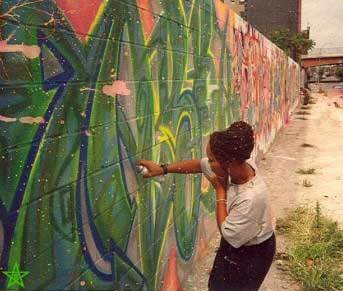 Her art was prolific in the 1980s blackbook culture scene as well as the 1990s wall art culture. In the new millennium, Abby has participated in live painting at several events and has made a return to street painting.